Here at Builders Sale we understand your demands for security and access control. Our featured presentation of Security panels from Access Panels collection is capable of providing seamless and safe access when you need it the most. Moreover, you can always decide the degree of protection from selecting the right fit from hundreds of solutions we offer under one roof. 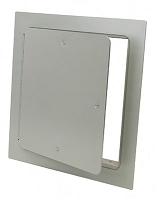 Security Panels and Security Access Doors from this class come with extra reinforcement, making them suitable for on-demand security applications like installations at correctional facilities, prisons, and even housing facilities. Integrate featured Security Panels we offer at Builders Sale and earn your peace of mind every time you count on us. 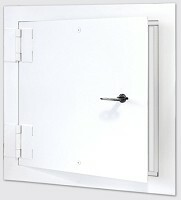 Constructed with 10/12 gauge plate, these doors are ideal when safety matters the most. In fact, door and frame both are constructed using the same 10/12 gauge plate along with tamperproof cam latches making them invincible and a precise choice for medium security jails as well as psychiatric institutions. Well, at the Builders Sale, we understand the significance of control in your life and provide the best solutions for the ultimate control you need. Come; explore our offerings and make the most from them. Unwinding is easy when Security Panels and Doors we offer work 24x 7 for you. 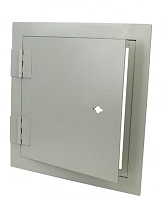 Acudor MS-7000 Medium Security Access Door 12" x 12"
Acudor SD-6000 High Security Access Door 12" x 12"
Acudor SD-6000 High Security Access Door 18" x 18"
Acudor SD-6000 High Security Access Door 24" x 24"
Acudor SD-6000 High Security Access Door 24" x 36"
Acudor SD-6000 High Security Access Door 36" x 36"
Milcor 3211-124-9 Security - Painted Steel Access Doors with Detention Lock 18" x 18"
Milcor 3211-224-9 Security - Painted Steel Access Doors with Tamper-Resistant Screws 18" x 18"
Milcor 3211-125-9 Security - Painted Steel Access Doors with Detention Lock 18" x 24"
Milcor 3211-225-9 Security - Painted Steel Access Doors with Tamper-Resistant Screws 18" x 24"
Milcor 3211-130-9 Security - Painted Steel Access Doors with Detention Lock 24" x 24"
Milcor 3211-230-9 Security - Painted Steel Access Doors with Tamper-Resistant Screws 24" x 24"
Milcor 3211-132-9 Security - Painted Steel Access Doors with Detention Lock 24" x 30"
Milcor 3211-234-9 Security - Painted Steel Access Doors with Tamper-Resistant Screws 24" x 36"
Milcor 3211-135-9 Security - Painted Steel Access Doors with Detention Lock 24" x 48"
Milcor 3211-235-9 Security - Painted Steel Access Doors with Tamper-Resistant Screws 24" x 48"